Medical sales training courses rarely mention the TV show, “24.” However, my training does. You frequently heard the main character, Jack Bauer, utter the words, “Trust me.” In these scenes, he was usually asking for information or for permission to help someone. Usually, these people were in dire circumstances with little choice other than to trust Jack. Your customers though, have choices. They don’t have to trust vendors, and frequently don’t. 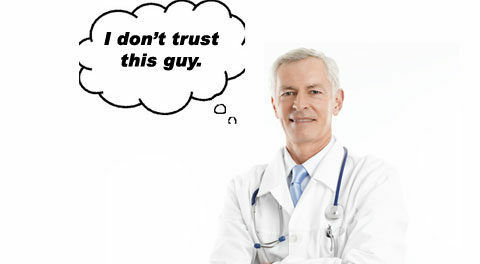 Is trust important in healthcare? Trust is everything! Patients must trust those who provide their care. Healthcare providers must trust the people who support them. That’s where you come in as a medical sales professional. 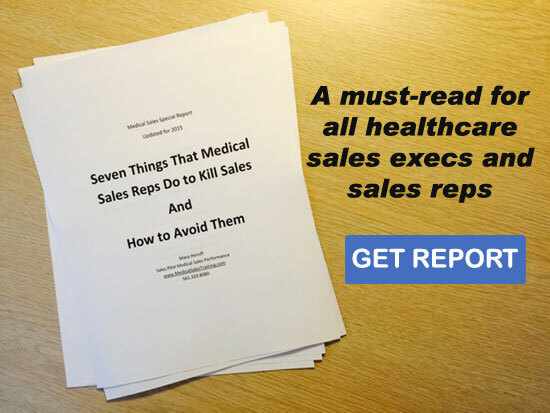 The biggest challenge medical sales representatives describe is getting time with healthcare providers or other decision-makers. They call it an inability to get past gatekeepers. Purported excuses include prospects who are too busy or just don’t see sales reps. However it’s voiced, it’s really a trust issue. If a doctor, nurse manager, or other prospect won’t allow you through the door, it’s because they don’t trust you to provide value equal to the time they have to give up. They don’t trust that your product will be better. They don’t trust that it will improve their situation or improve their patients’ outcomes beyond what they are now. They don’t agree to see you because they don’t trust it will be time well spent. Why don’t customers buy after you your sales presentation? Trust! They don’t trust that your product or service will do what you say it will. Maybe they don’t trust that your company manufactures reliable or innovative products. Maybe your customers just don’t trust salespeople. After all, every sales rep makes promises, but experience tells them that often, these are empty promises. Under-promise and over deliver. It’s not enough to just do what you say; you must meet or exceed the customer’s expectations every time. If you make a claim that your product is going to outperform their current product, it damn well better do it or you lose credibility…and trust. That’s why it’s stupid to make a claim like that in the first place—it sets you up for failure. If you underpromise instead, and the customer thinks, “Wow, this is way better than you described it,” you’re a hero. Put the customer’s needs and the patient’s needs above the sale. Your job is to make the sale—I get it. Just don’t sell a product that isn’t ideal for the customer or the patient. I had a surgeon who wanted to thank me for bailing him out of a tight spot. He suggested he evaluate one of my products. I knew he would hate it—compared to what he was using, it didn’t work nearly as well. I said, “Doc, thanks, but you won’t like it. It doesn’t work as well as what you’re using now.” He said, “Mace, I’m trying to give you business.” I replied, “I know and I appreciate it. I just want you to know that I will always tell you the truth and if something isn’t better than what you’re using, I won’t even show it to you.” From that point forward, he evaluated everything I brought to him. Why? Because he trusted me! I put his needs and his patients’ needs first. Speak well of others or say nothing at all. There is a misperception that bashing a customer’s competitors is endearing. It’s not. When you speak negatively in front of customers, they’re thinking, “I wonder what he says about me?” It’s hard to trust someone who spews negativity about others. If you don’t have anything good to say about someone, keep quiet! Always tell the truth. Always! Do you know a difference between a white lie and a lie? The color. A lie is a lie and when you get caught, trust is gone—often forever. In the business of healthcare, where trust is paramount, why would you risk it? Salespeople lie to save face (“My company shipped the wrong product,” “ I would have been on time but the traffic was bad,” I emailed you the information you requested…didn’t you get it?”) or to make a sale. Regardless of the reasons, it’s never a good thing. One problem with lying is that you will eventually get caught, and there are few things more uncomfortable in business than getting caught in a lie. More importantly though, when you lie, you’re potentially compromising the well-being of a patient. It’s unethical, morally corrupt, and it can also get you sued. It is said that sales is a relationship business. What that really means is that it’s a trust business. Sure, someone has to know you to trust you, but knowing or liking you isn’t enough. Someone can like you, but if they don’t trust you, you’re toast! Although the article does cover managing customer expectations, how about adding a marketing orientation to the while sales process. Taking feedback from the users makes the sales process more marketing oriented and helps the companies develop and sell products that the customers want.